For one unlucky Member of Parliament, a simple visit to the hospital (the “nursing home” of the title) proves fatal. But as Inspector Alleyn will discover, any number of people had reason to help the gentleman to his just reward, including the sour surgeon, his besotted nurse, a resentful wife, and a cabinet full of political rivals. The Nursing Home Murder is widely considered to be the book with which Ngaio Marsh, said the Times of London, “transformed the detective story” from a mere puzzle to a full-blown and fascinating novel. This is #3 in Ngaio Marsh's titles, and the dust cover says that it continues to be one of her most popular novels, and has outstripped all of her other novels in sales. First published in 1935, it is the precursor to those Robin Cook-style medical murder mysteries. I didn't think there was anything dated about the writing or the plot. The setting is mainly the operating theatre of a small hospital (not the narrow meaning that nursing home has come to mean today). Roderick Alleyn has two sounding boards for his theories - his assistant Inspector Fox, and his journalist friend Nigel Bathgate. The victim is the Home Secretary suffering from appendicitis and peritonitis, who collapses in Parliament when introducing a controversial Bill related to terrorists and anarchists. (this will have a familiar ring for modern readers although set 80 years ago). The appendix is removed successfully, but the patient never comes around after the operation. When an autopsy reveals that Derek O'Callaghan has been poisoned, the plot revolves around whether his murder is related to the opponents of his Bill, personal problems relating to an affair, or even side effects of pain relief administered by his doting sister. The plot keeps the reader guessing right until the end. Very readable. It's the only novel Dame Ngaio wrote with someone else. 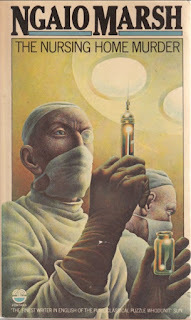 The first edition listed the authors as Ngaio Marsh and H. Jellett - the latter a surgeon who Dame Ngaio worked with for the book. In a nice nod to a fellow Queen of Crime, this novel is being read by a character in one of Agatha Christie's later tales, Murder in Mesopotamia. Kerrie Smith is a renowned Australian crime fiction reviewer and the creator of Mysteries in Paradise, an outstanding online crime fiction resource where this review was originally published. She also runs the Global Reading Challenge. Kerrie has been kindly agreed to share her New Zealand crime fiction reviews here with the Crime Watch audience.